HELP ME FIND A CURE FOR CANCER! Summer is here! Can you believe it? Well I can’t either and one of the ways I’m going to spend it is to train for my first Triathlon! Yes I said TRIATHLON!!! There’s no way I could do this on my own, so I’m teaming up with the Leukemia & Lymphoma Society TEAM in Training program that will provide me all the coaching, encouragement and great team environment to prepare me for the Nautica Malibu Triathlon on September 16, 2007. As many of you know, my faith has become a huge priority in my life since 2002. I just finished a one year study on the Holy Spirit and what I learned is that life in the Spirit allows me to feel things I don’t feel, do things I can’t do and know things I don’t know. This triathlon will allow me to grow in my faith. I am also doing this in memory of my dear friend, Barbara Gaston who recently passed away from lung cancer. 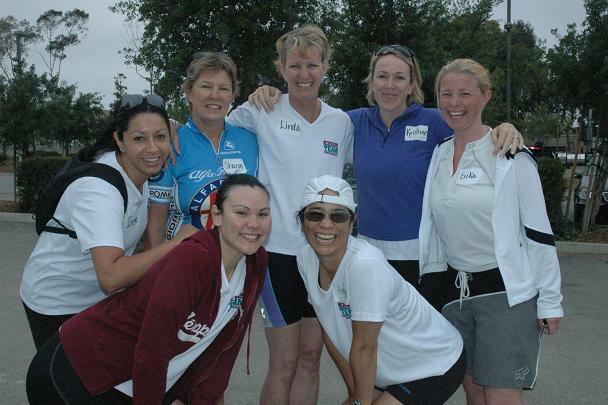 I miss her deeply, but the timing of participating in this triathlon with TEAM in Training is a way for me to keep a smile in my heart and inspires me to make a difference for someone else who is affected by cancer. TEAM in Training provides each team an honored team member. This person provides the motivation to remind us why we are doing all the early morning trainings and race. My honored team member is Natalie Wood. She was diagnosed with Hodgkin's disease at six years old. The doctors removed a tumor from the right side of her face and she underwent six months of radiation therapy from her head, neck and entire torso. Because of the radiation treatments to her head, she was told she would have trouble processing shapes and numbers, yet she went on to become a physics major at one of the nation's top engineering schools and will be graduating from law school in December. Natalie would have never been able to realize that dream if it had not been for the support by the LLS. While she still suffers many side effects from her radiation therapy such as scoliosis, decreased vision, and a reconstructed face, she is alive and well. And to top it off, she completed the same triathlon last year I’m training for now! Now here’s where I need your help. I have committed to raise $3400 and I’m asking you to help find a cure for all blood cancers by joining Team Nicholas and sponsoring me. You can go online at http://www.active.com/donate/tntors/AmyNicholas or you can use the attached form and send me cash, check or your credit card information. If you’re not able to sponsor me at this time, then I ask that you pray for me for strength, courage and endurance. Join Team Nicholas today and together we can make a difference! Thank you!